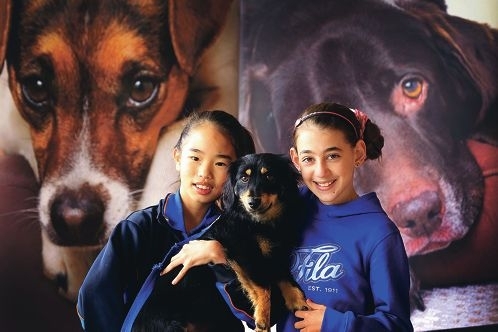 Samantha Seah (11) holding Velvet and Brianna |Monforti (11) are fundraising to help abandoned |animals. Samantha Seah, of Piara Waters Primary School, and Brianna Monforti, of Ranford Primary School, are both enrolled in the Primary Extension and Challenge program at Thornlie Primary School. For their Make a Difference exercise, the Year 6 students are working with Dogs West to raise awareness of the work that SAFE Avon Valley does to rehome abandoned dogs. They are seeking donations of wet and dry dog food, blankets, toys and flea treatments, or cash donations, which are tax-deductible if more than $2. As part of Kids Who Give WA, the girls will give a presentation on their fundraising achievements at Government House on August 2.